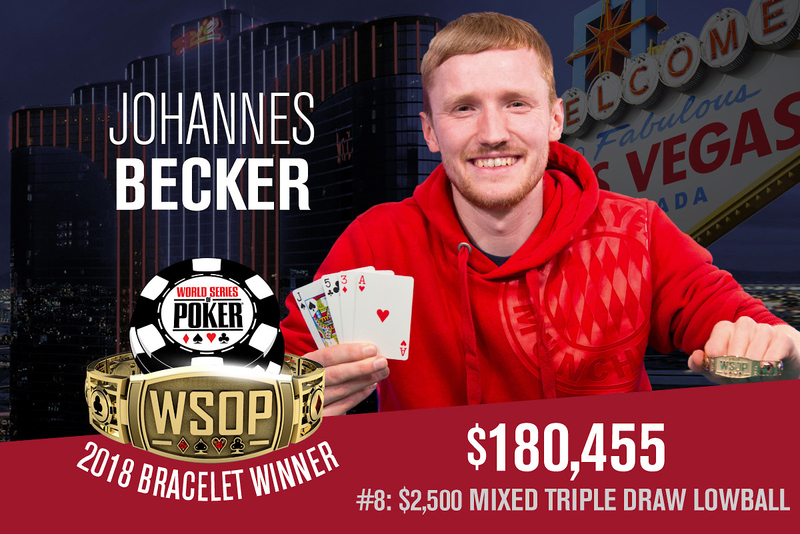 Tags: 2018 WSOP, Johannes Becker, Triple Draw Lowball. Posted on Thursday, June 07, 2018 by "T". It was last year's WSOP $50,000 Poker Players Championship that Johannes Becker finished runner-up (2nd place), but this year the German is no more settling for second best after he managed to defeat Scott Seiver to win Event #8 $2,500 Mixed Triple Draw Lowball for $180,455. The victory comes as a complete surprise considering Becker had the second-lowest chip numbers as he came into the final day of play with 12 players left standing. It was Michael Wagner who had fewer chips than Becker at the time. After quite a turn of events, all the chips eventually fell to Becker's side, all 4 million of them, as he worked up his way knocking off a player field of 321 entrants that combined a total prize pool of $722,250. Only the top 49 finishers are set to earn a cash prize. He said, "I didn't expect to win. I started catching cards and that worked out great." Some of the final tablists that Becker had to deal with were Chris Vitch, who won the exact same event in 2016 for $136,854 as well as Scott Seiver, who won his sole bracelet 10 years ago. During the three-handed action, it was Seiver who had nearly 75% of the chips but Becker managed to take them all in the end, earning himself the top prize money and his first-ever WSOP gold bracelet to add to his name. 10 comments for "2018 WSOP: Event #8: $2,500 Mixed Triple Draw Lowball won by Johannes Becker for $180,455"
well triple draw lowball is quite an interesting game to play, probably these fellas were just warming up to bigger events and decided that taking a day or two off the usual no limit texas holdem is the way to go. and for Johannes becker it was a day to remember. Very beautiful this idea with bracelets offered to winners of tournaments. Instead of receiving small cups or another prizes they chose this option which is a good idea. I think these winners Praise in front of his friends with these bracelets. I think i would do the same thing. Congratulations to the player for this performance. Not bad for a first place win. I cant say that I understand this game and I think that I havent play in my life this kind of poker,but for this player was great,because he got very good first prize,over 180K $!buy in big also,but it worht for him!now he spend on buy in on other wsop tournaments! Big congratulations to Johannes Becker on being crowned champion of the $2,500 buy-in mixed triple draw low ball tournament. What kind of game is this? I don't think I have ever played it in my life. I apologize for my ignorance. Lowball inverts the normal ranking of poker hands. Triple Draw is played mostly lowball. This means that the weakest hand wins. There are two ways to evaluate. This game or games has some rules that are not in our liking. I do not play thes games. Anyway, congratulations for the winner.